As daughter Maya plays with her doll, adoring father Picasso plays with his latest artistic processing of space and colour. The plastic phase of figurative distortion is continued, while the characteristics of the face are pushed and remoulded, as though constructed from modelling clay. 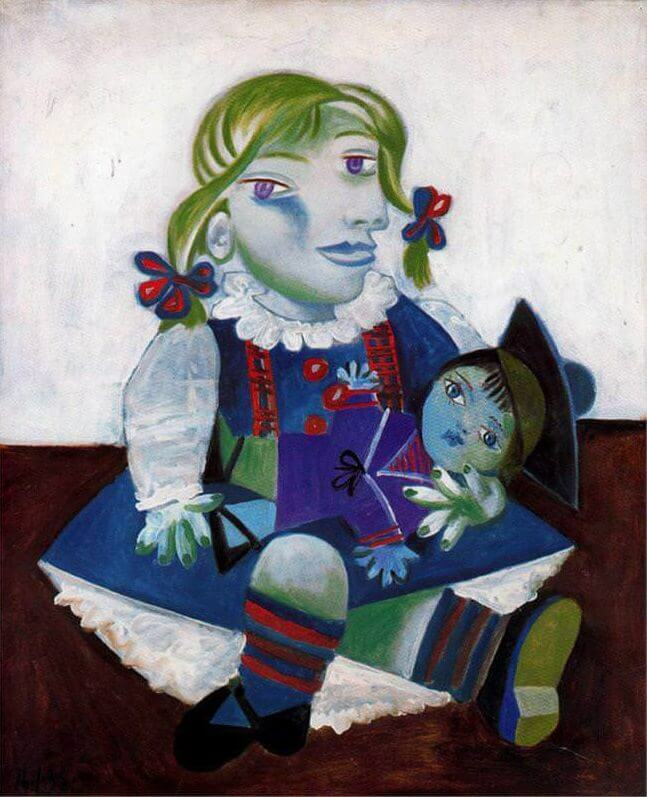 As always, Picasso's sense of fun and humour surface: the doll has the real face, whereas that of the child is surreal, a beautiful juxtaposition. Both heads are absurdly enlarged compared to the rest of the body. The doll's eyes match Maia's outfit and Maya's match the doll's sailor's costume, and so the child is interchangeable with the doll. The doll is probably a bizarre signifier for Picasso the father, who as a child was also pictured dressed in such an outfit. In the same way, Picasso was interchangeable with his son Paulo in the harlequin costume in his portrait of 1924. Despite the modernist distortions, this painting of Maya is suggestive of that earlier sentimental picture. The cuffs, ruffs and frills of sixteenth-century Spanish master Diego Velazquez, featured in the Paulo portrait, return here in Maya's frothy attire. They serve to define the body's pyramidal outline against the simplistic horizontal blocks of brown and white that separate the floor and wall planes.